Who could have given a better description of the motive? Laszewski is critical of the plan’s potential for creating a new set of winners and losers, but his objection losses sight of the fact that distortions in the ACA create so many winners and losers as to be indefensible. For example, the ACA limits differences in age rating, effectively transferring wealth from younger premium payers to much wealthier seniors, while the GOP plan loosens those limits. Similar distortions were created by Obamacare’s mandates, taxes, lack of choice in health coverage, revocation of individual coverage, poorly designed provider incentives and reduced physician reimbursements, to give a short list. I like many of the ideas in the Republican plan, but it is a compromise. Its reforms should reduce the cost of coverage. It increases choice, leverages market incentives, and reduces tax distortions, including the tax advantage of employer-provided coverage. At the same time, it wholly or partially retains ACA provisions that make coverage more affordable at low incomes and provide continuous coverage for those with pre-existing conditions. It also encourages the creation of state pools for high-risk individuals. These provisions might or might not mollify “consequentialist” sentiment on the Supreme Court, leading to a majority ruling against the government in King vs. Burwell. 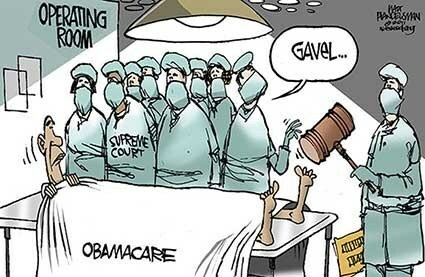 If not, and while the question before the court is more narrow, the irony would be for the court to uphold the many destructive consequences of Obamacare.